The long-awaited weekend has finally arrived, and I am as nervous as a fox at a hound convention …. Yesterday, I finished the program with a strong five-miler; at an 8:00 min/mile pace, it was faster than race pace, but it felt pretty comfortable so I went with it. More important, I came through the week, and the whole program, without injury or even muscle soreness. At the risk of jinxing myself, I think I can honestly say I’m in the best shape I have ever been prior to a race. My coworkers have been amazing throughout the whole process: listening to me go on and on about my training, encouraging me and donating. 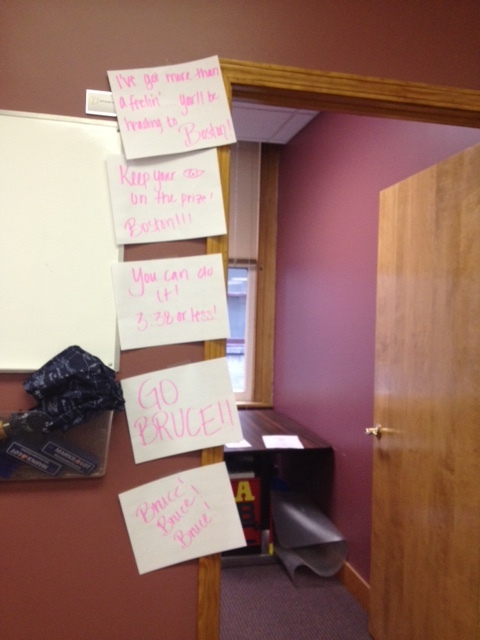 Today, they were plying me with food and decorating my office. I know their support, and the support of all the Team Fox donors, will keep me going during the hard miles ahead. After a tough day trying to concentrate at work, it was time to go home and make final preparations. First, the food. 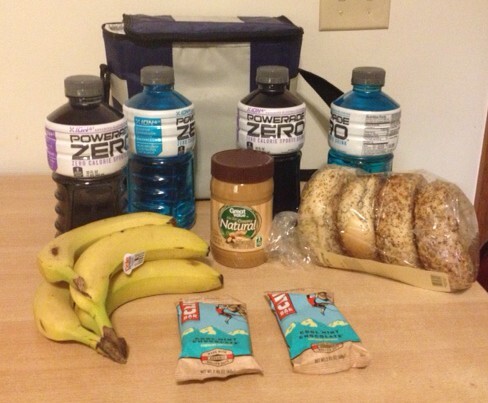 Sticking with the tried and true–bagels for carbs, peanut butter for protein, bananas for potassium, Clif bars for snacking and plenty of hydration. There’s enough there to choke an army, but I am determined to keep the fuel levels topped up all day tomorrow. If I bonk, it won’t be for lack of food. Next, the packing. Like all marathon runners, I suspect, I have spent the week viewing the weather forecast with great trepidation. The consensus opinion seems to be temps in the mid 50s at gun time rising to the 60s at noon with a threat of some early light rain showers that will clear out during the morning. In other words, perfect marathon weather! As I usually do, I packed more gear than necessary, including long pants, gloves and a long-sleeve shirt for layering which I probably won’t use. There’s the all-important Team Fox T-shirt, which I have to wear for obvious reasons, the ubiquitous fanny pack (much to Team Love Nugget and Andy Wheatcroft’s disgust) and my trusty, sweat-stained 26.2 hat (much to Tessa’s disgust) that has accompanied me on every marathon except Toronto. And my watch. I mustn’t forget my watch. If nothing else, marathon running makes me a creature of habit. But it’s important to control the things I can, as Lord only knows it gets crazy enough once you’re out there. If you are interested in following me in real time on the day, you can sign up for free text, email, Facebook or Twitter alerts or download the free MCM app and see an icon of me running on the course! Simply enter in my name or bib number–11099. You can also follow the race on YouTube, though I am guessing that it might be tough to pick me out in the midst of the 30,000 other runners that will be out there at the same time! We’re up to an incredible $912.4 as of 8:00 PM, and that’s without the contribution of my wonderful anonymous donor! My friend’s matching donor challenge is still in effect, which means donations are still being doubled. So don’t forget to go to my fundraising page and make a donation to the Michael J. Fox Foundation and help eliminate Parkinson’s! What are you doing to keep your nerves in check? Are you ready to hit your goal? Send me your thoughts and I’ll feature them in the next Semper Currens. This entry was posted in Semper Currens, The Flat-Footed Fox and tagged Hanson's Marathon Training, long-distance running, marathon training, Marine Corps Marathon, Michael J. 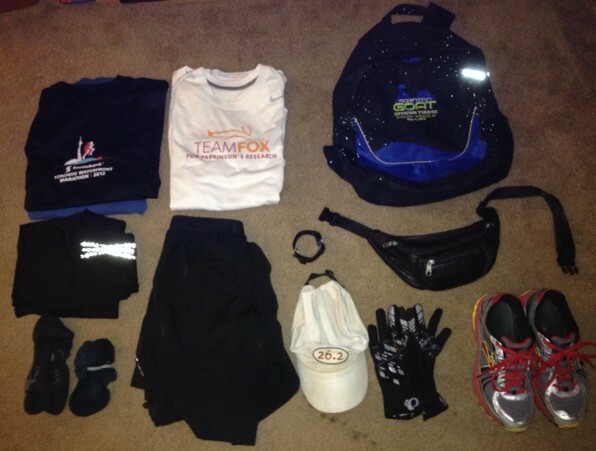 Fox Foundation, Team Fox, virtual running, virtual training. Bookmark the permalink.